So I was thinking about my last post – I have been thinking about it since I wrote it – and it hit me all of the sudden: “Geez! You are being so WHINY!” I mean, I have been doing this diet since September, fully planning on making it a permanent part of my life. I was going to the gym regularly – I’m not sure why I stopped. I’ve lost almost forty pounds and have had a level of commitment that I’m not sure I’ve ever had before… and all I can do is whine about my upcoming vacation?! So today I decided to stop the pity party. That really was what it was; I haven’t lost any weight in a couple of months and I haven’t really taken the time to figure out why. I have probably done what many others have done throughout the winter and let some things slide that I normally wouldn’t have. I think that my focus needs to change from pity-party central to trying to clean up my diet. I have thought about doing a Whole 30, but I think I can clean up my act pretty well without that. I went shopping today after browsing Chowstalker.com, so I have food for the week. I also found Everyday Paleo Lifestyle and Fitness. I have a feeling that this site is going to be my saving grace. I think that the whole Crossfit debacle was a total downer for me (probably part of my mental problem), but this site lists workouts that seem very similar to Crossfit workouts, but they have a beginner’s level! Meaning that I can work my way up the the intense Crossfit stuff. They even have tests for you to do in the beginner level so that you can tell whether or not you are ready to go on the the next level. I am very excited about starting that this week, as well as cleaning up my eating. So tonight I made Stuffed Peppers and they are awesome (I say they are awesome because I am eating them right now). Tomorrow I am going to be working on 5-Spice Slow-Cooker Pork Ribs (although I went to EarthFare with the express purpose of buying some coconut aminos, but walked out of the store with a lot of other stuff – and no coconut aminos). My biggest problem is finding stuff to munch on, since I seem to be hungry a lot lately, but I will figure that out, too. I am going to clean it up and pay attention to my body, and hopefully soon I will have a very positive update on weight loss or a pant size lost or something like that! At the very least I can talk about how much better I feel. Okay, I have a confession to make. Last week was a rough week. I have had SO many wonderful things happening that I had to cut some things loose, which broke my heart (although this week I have found out that I didn’t really cut them loose at all). By the end of the week I was ready for a stress-free weekend – meaning no work, no school, no extra-curricular planning for the teacher trainings that I am going to do… and no stressing out over the diet. I pretty much ate whatever I wanted except for the bread, rice, pasta, or potatoes. And I loved every bite of it. This week has been rough, of course, as my body tries to rid itself of all of the sugar that I inevitably ate over the weekend. I’m sure there was other stuff in all of that food that I ate, too, but I do have to say that I needed that plunge. I was happy that I was able to keep my self-control enough to not be tempted by the bread and things like that – especially since the biscuits and gravy seemed to be calling my name at Golden Corral on Sunday morning. As I reflect on the weekend and how proud of myself I am, as well as taking mental notes on the hell my body is going through right now as it recovers, I am getting a little worried about the annual vacation that my fiance and I take each May. I’m not incredibly worried about anything except the very first meal that we are going to have, which will be at a little seafood joint in Wilmington. If I remember correctly, they don’t have a lot of broiled or grilled anything on their menu. Last year I caved so bad at the same restaurant – the first meal of the vacation. But last year in May I wasn’t on the Paleo diet, I didn’t have the conviction behind me because I hadn’t been able to observe how my body handles some foods. I was on a regular low-carb diet then, still eating dairy and probably a lot of other things that I have found since then do my body incredible damage. My self-control was lower than it is now because I was eating things that was causing my body to crave other things. That isn’t happening since I have found out what my body can handle and what it can’t. Usually I don’t let it stress me so much, but sometimes I go into the annual vacation thinking, “It is vacation! Eat what you want and then come back and get over it!” However, I know how hard it is to start over on this diet. I know that once you eat the carby food, you crave more and it could snowball – especially since I have been so addicted to carbs my whole life. I know how hard it is to start over, and I know how rough that two week period where your body heals and gets rid of the crap is (I’m going through it again right now!). I don’t think I could allow myself to go into this vacation and eat whatever I want, especially since I have made such great progress. I guess part of my problem is that I know that it is going to be hard to plan for everything, but at the same time I know how great my self-control and motivation has been. I know that I will probably be fine, but I want to be able to enjoy myself and have my fiance enjoy himself while we are on the vacation. I know that enjoying myself doesn’t have as much to do with the food, and that I can get through the vacation on the 80%-20% rule – although I’m really not sure what the 80%-20% rule is. Maybe it is exactly how I ate over this past weekend. If it is, I think that I will probably be fine. Yes, I did it. 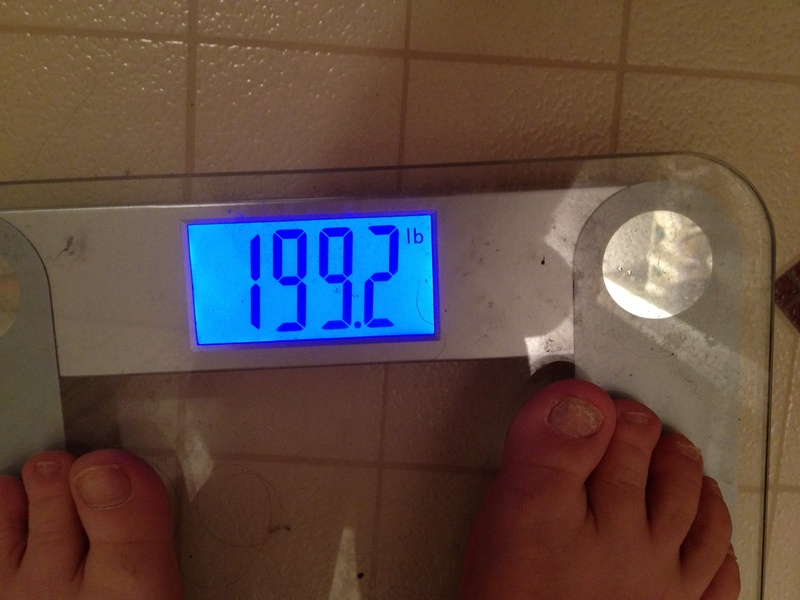 I made it to my goal of being under 200 lbs. before New Year’s. What a great feeling! This is the first time that I have seen a one at the beginning of my weight since I was pregnant with my second child six years ago. So I am definitely celebrating today! I recently wrote about my weight loss slowing down, and how aggravated I was about it. After I wrote that post, I began counting my calories so that I could figure out what was going on. On the first day that I counted, I only ate a little over 1400 calories – a number that seems almost impossible to me! I don’t think I have eaten that few amount of calories voluntarily…ever! Then I started looking at my habits. I had begun to skip breakfast because my mornings are so busy. I would make breakfast, but then I wouldn’t eat it until lunch because of all the running around I was doing. You would think that I know better than that! I believe that was what has accounted for the majority of my issues when it comes to consuming too little food. I have had a little down time this past week, so I have begun trying to come up with a new plan for when school starts next week! Especially when doing Paleo! I got sick a few days before Thanksgiving – nausea, diarrhea, no energy. When my daughter got sick with salmonella a few days later, I thought that was what I had experienced. But a few weeks later, I got sick again in the exact same way! So I pulled out my Paleo Diet Book to try to find some answers – and find answers I did! Apparently, if you eat too much protein without vegetables or fats to go with it, you will get sick – with diarrhea, nausea, and no energy. My days of skipping to the grocery store for a rotisserie chicken and nothing else have been over ever since, and I have been trying to find some new, yummy things to put on my salad to add more flavor. My current favorites are a basil-infused olive oil that I found, and red wine vinegar. I have also added more avocados to my diet – I can’t get enough of those, anyway! Last night I made up a double batch of Garden Fresh Meatballs so that I will have something to fall back on when I get tired of the salads. I will let you know how well they come out after being frozen! I have been repeatedly laughed at and made fun of for some of the things that I have become very hard-core about since starting this diet. Like, I won’t eat anything if it has any type of sugar in it. I have found out from experience that even the smallest amount of sugar will give me GI problems that cause a lot of pain and heartache (or stomachache, actually). It isn’t worth it. I read the hell out of labels to make sure that there are no hidden starches or sugars in anything. The bloating, pain, and other things aren’t worth it to me, either. Sometimes I eat something that causes the scale to tick up slightly, but as long as I think that the splurge is worth it in the long run, it is okay. I definitely stay away from wheat and bread products. I inadvertently ate a cracker one day at the farmer’s market and I was so sleepy and run-down for two days! That is definitely not worth it! I have found out that my body can handle sweet potatoes pretty well, so I have added them to my diet – not an every day thing, but I will eat one every now and then. I have been on the lookout for some new recipes, because we all get tired of the same old thing over and over again. I have found that I can take a lot of recipes, use different spices in them, and have a totally cool new eating experience. I did this last night with my Garden Fresh Meatballs. I have found that altering recipes just slightly to please my taste buds goes a long way in determining whether or not I am satisfied – as in, I don’t desire anything else to eat when I am done eating. I have modified so many recipes in this way, from the Crusty Chicken recipe (which is actually a fusion of two other, different recipes), to the Best Chili Ever recipe, which I have to modify because it didn’t agree with my stomach at all (it sure did taste good, though)! I am also trying to figure out a way to modify my salmon, because I eat that a lot for breakfast, but it really is getting old. One thing that has amazed me since I started this is how much stronger I am. I haven’t been doing any cardio since I read the “Body by Science” book, and I have enjoyed my workouts so much more because of it! It really is fun to go and lift, and when you realize that it is time to add more weight, it is super exciting! I wish that I had written down what weights I started with when I started lifting, but all I know now is that I love going to the gym, and I love that my workout is so short – just 30 minutes to an hour, depending on how motivated I am. When someone mentions doing cardio when they are with me at the gym now, I cringe and try to get out of it any way that I can. I did get on the elliptical machine a few weeks ago, and I was amazed at how much better I did on that machine than I did before I started lifting. I can definitely tell that I am stronger! I have no idea how much muscle I have gained, but it doesn’t matter – all that matters is that I fit into my clothes better! I have seen or heard many things that have come out of expert’s mouths that have actually sounded common-sense to me lately, but only if you think about it in the context of a Paleo diet. When I think about them in terms of SAD (Standard American Diet), they make no sense at all. I’m talking about the studies that say “Eating this or that can help prevent this or that disease” or things like that. I am going to have to start keeping up with these things that I hear, because I can’t think of a single specific one now that I am trying to write about it, and it would be fun to put them in their own blog post. I am so excited looking forward into the New Year – excited about all of the things that I can accomplish now that I have accomplished this. This is so huge to me, because I have been trying to accomplish it for about two years now! And with this new lifestyle, I accomplished it in three months! I went through all of my “skinny” clothes yesterday – I haven’t done that in a LONG time, and there were clothes in there that I had forgotten about! It was so much fun going through those clothes and knowing that it really is possible to be wearing them again! And that is my next goal, to be able to fit into those clothes again! It will happen in this coming year, and I am excited about sharing the journey to get there! Well, we are right smack in the middle of the holidays, and I bet you are thinking, “Gee, she hasn’t posted in a while. I bet she fell off the wagon HARD!” Well, you would be wrong – I have made it through so far with my new-found lifestyle intact. It made for an interesting Thanksgiving, but I plan on trying some new recipes that I found to spice up Christmas a little bit. I am really enjoying the winter squash that is in season now, although I miss all of the summer vegetables tremendously. I’m not sure that I’ve eaten this many navel oranges….ever, but they sure are delicious. Lately my weight loss has slowed, but I have had a busy few weeks. My oldest daughter got really, really sick and I had to take her to the hospital twice in one weekend. My other daughter has gotten sick twice. The end of the semester was crazy. Through it all I stayed on my Paleo diet, although I think that my meat to vegetable ratio has suffered. I think that I’m eating WAY too much meat now and not enough vegetables, but I haven’t gotten off the wagon by any means. I am trying to figure out how to tweak what I am doing so that I am back where I need to be. I ate a huge salad today and I hope to be able to do that every day. I found out today that my garlic-infused olive oil tastes really good with red wine vinegar. I have been craving some Garden Fresh Meatballs in the last twenty-four hours, so I will probably make some of those this weekend. I know that I’m still losing inches, but it has definitely slowed down. It isn’t a bad thing, but since I’m in the middle of a month-long break from school this is the perfect time for me to get things back going. I haven’t been to the gym since my daughter got sick, so I’m going to get started going back tomorrow night. I may try to sneak in some Power 90 workouts too. I’ve really started missing those workouts for some reason. I think that part of me knows that I can do much better at those workouts now, and wants to see just how much better I can do. But maybe sometime. Not now. Well, this has been a very rambly post, and it is definitely time for me to end it here. I hope to check back in after the beginning of the year, if not sooner! I have been doing a bit of online research this morning, and I came across a blog post about weighing yourself when on a diet. A woman named Deb is featured in the post, with pictures of her at 155 in the before picture, looking very unhappy, and at 155 in the after picture, looking much more fit. Yes, you read that right. She weighs 155 in both pictures. She is on a Paleo diet. Reading this is great for me, because my scale hasn’t budged an inch in a few weeks, which is usually pretty frustrating for me. It would be this time, too, but I feel so great eating this way that I have stopped caring about the scale. Not to the point where I won’t get on it, but I get on it less. And still it hasn’t moved. And yet coworkers tell me that it already looks like I have lost more than the scale tells me I have. I look at them unbelievably when they tell me this because I can’t believe it. But I go on eating this way because of the way it makes me feel. And I work out, too. But then came another blog post. Now here is the point where my fiance is going to get a little frustrated with me. He and I are very big into researching things. I usually research along the way (hence the reason for all of the “along the way” blog posts) and he researches beforehand. He’s been telling me about the no cardio “thing” for a couple of weeks now, and telling me I need to read “Body by Science” by Doug McGuff and John Little. He has formulated a workout that he does every time we go to the gym that incorporates weight lifting and no cardio. And he finishes his workout while I am still struggling along on the elliptical machine, usually finishing his whole workout at about the same time that I stagger off of the machine, about to die – when I am ready to begin my lifting. So I am happy to report to him that the book is the next thing on my immediate reading list. I will let all of my droves of readers (ha ha, joke) know how the book was. Oh wow. This Paleo thing isn’t a diet – it is a freaking miracle! One of the most wonderful miracles that I have found, and I am taking advantage of it! (Or I will be when I get myself off of that elliptical machine – I have been telling my fiance that it is no joke, and now I’m starting to be convinced that it is of the devil!) I can’t wait to be able to blog about the information I find out about these new finds of the day! *I must also throw in a disclaimer. I am not a religious person, so any mention of devils or miracles in the above post should not be construed as religious zeal, whether positive or negative, toward any particular diet or workout machine. *I must also throw in another note: While Deb is eating 3900 calories a day, I believe from some of the tags on the posts that she is doing Crossfit, which to me means that she is also burning a heck of a lot of calories. Using common sense, I do not advocate or think it wise to start eating calories like nobody’s business simply because Deb is eating 3900 calories a day.